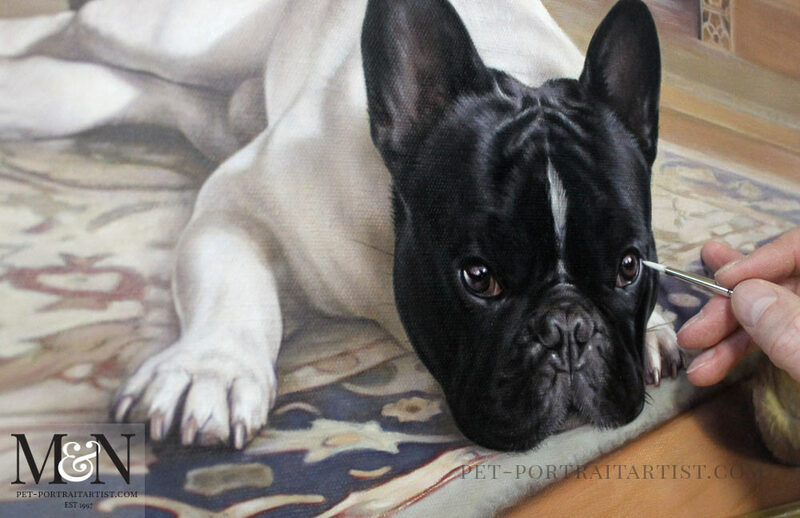 Welcome to the Pet Portrait of Agarn! 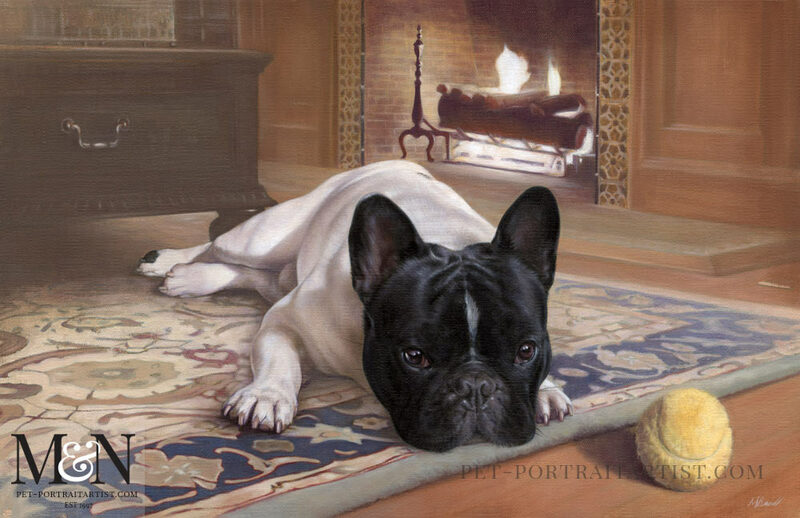 The portrait was commissioned by our client Bill in the USA. It was to be a complete surprise for his husband at Christmas 2017. We worked closely with Bill to create the perfect composition of Agarn. Bill wanted the portrait to show Agarn in their living room and so using a few new photos taken without the recipients knowledge. We used a number of photos to create the design below. Nicholas was able to combine them to make a full scene. 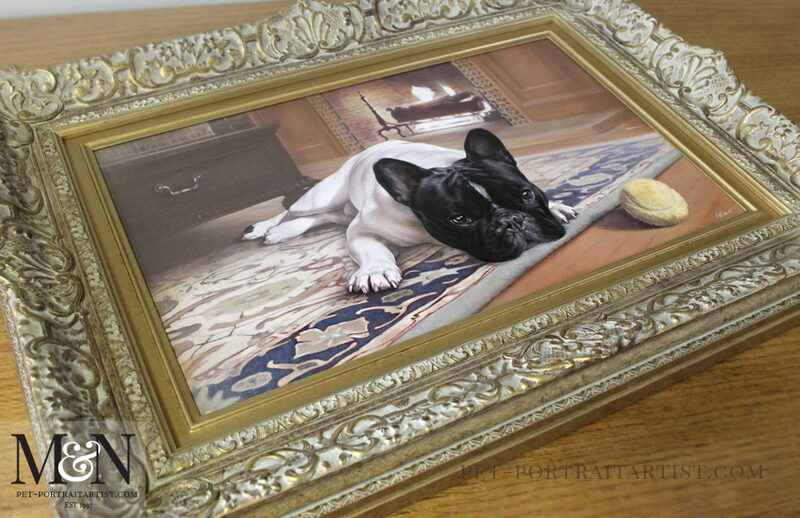 The portrait is a 22 x 14 inch oil painting on Italian linen canvas and is framed in the most wonderful gold frame. As a result the entire painting took a number of weeks to complete and we took plenty of in progress photos and video for our clients to see too. Here are a few photos of the painting close up! I have taken a 3 minute video of Agarn. You can also see close up shots of the frame in the video too. I find that sometimes a scan of our portraits doesn’t really show how three dimensional they are. So taking video for our clients to see is so much better than a static photo. 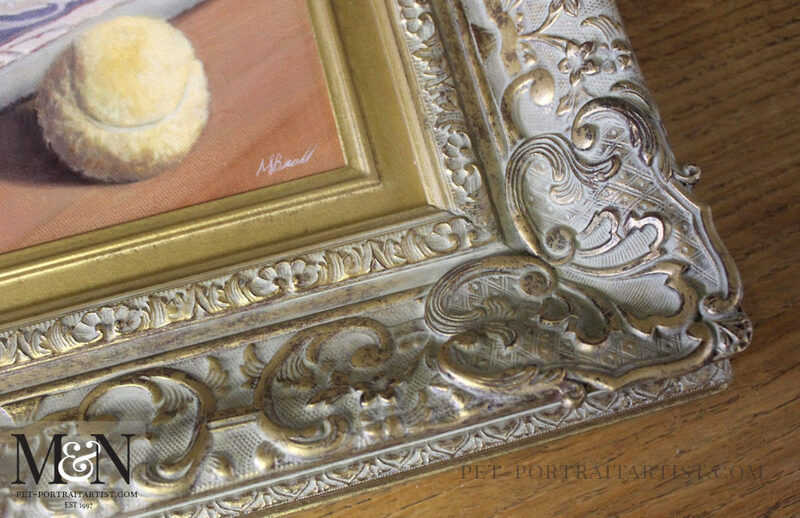 It’s lovely for our clients to be able to see the paintings and frames in more detail. You can also see a few videos of the portrait so that you can see it in a much more three dimensional way. Here is Agarn Framed! There are no real words to describe how beautiful this frame is. As you can see from the photos it is truly stunning. 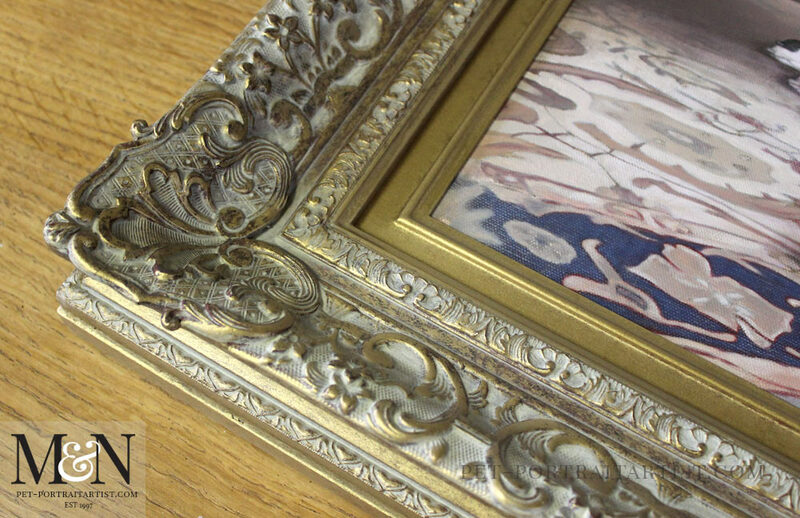 The frame is called ‘Kensington’ and it is hand made by our framers. It was hand finished for our clients to this particular colour and tone. This was to match in with frames our cleints had in their home. It has been aged with a bluish tint. If you look at some of the close up photos below you can see the finish in more detail. 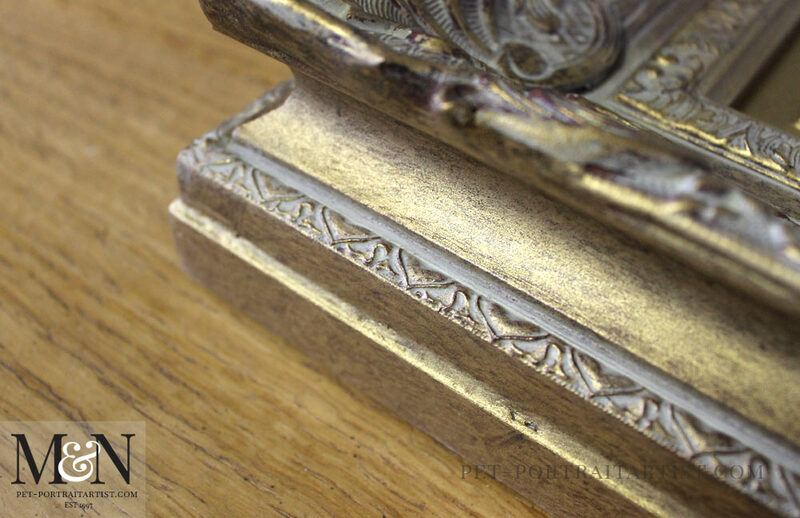 What we also love about this frame is the detail on the side of the frame too. If you look at photos taken from the side of the frame itself you will see a beautiful pattern along the edge. It really compliments the main pattern of the frame. Our framers very cleverly build each frame to the exact depth required to cover our canvases. 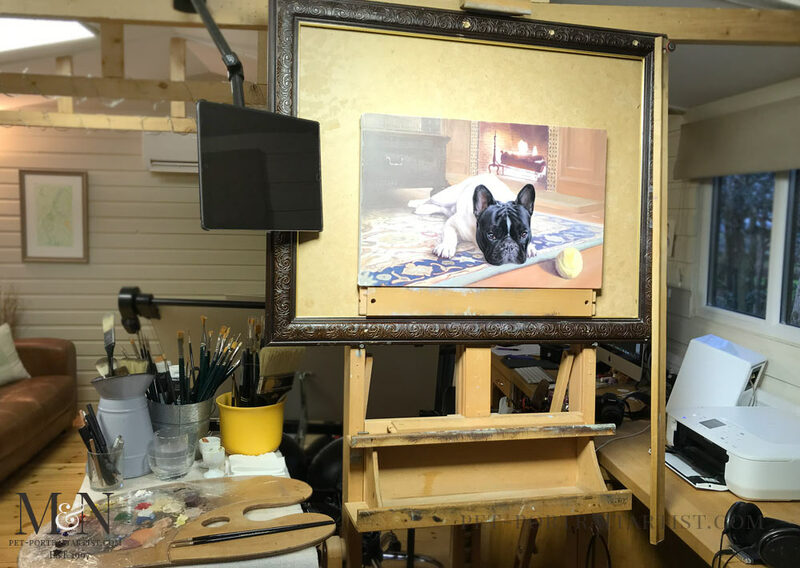 Why not take a look at more photos of the frame on our pet portraits Kensington Frame page along with our dog portraits framing gallery too. Here are some of the video stages of Agarns portrait. 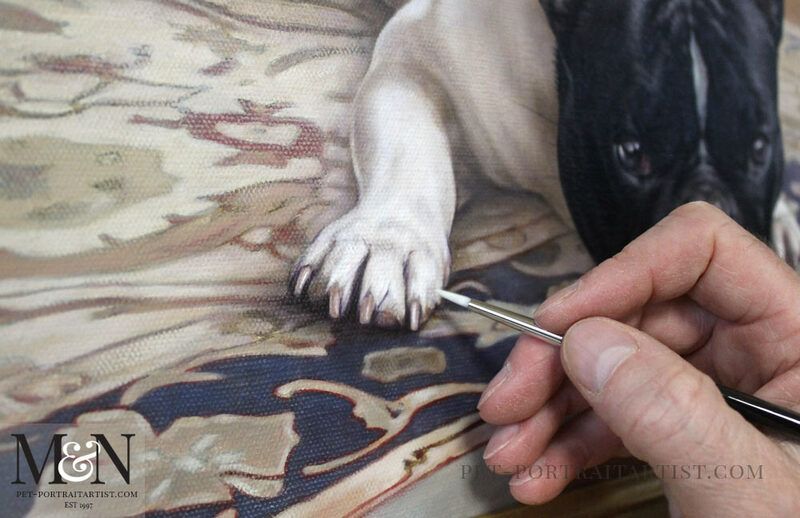 As you scroll down the page you will see the painting progress photo too.